Two neighbouring shops in a high street location in Middlesbrough are among the commercial properties which feature in a bumper two-auction, 103-lot catalogue just released by SDL Auctions North West. The adjoining units will be going under the hammer at SDL Auctions North West’s auction on Thursday 21 February at the AJ Bell Stadium. Both are freehold three-storey properties with a retail unit on the ground floor and two floors of ancillary space above, with the potential to convert to apartments, subject to the necessary planning permissions. The larger of the two, 107 – 109 Linthorpe Road, Middlesbrough, is a double retail unit extending to 137.3 sq m (1478 sq ft) on the ground floor, with a *guide price of £228,000+. 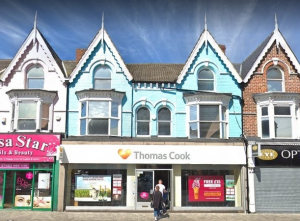 It is the former home of Thomas Cook and, while the travel agents may have packed their bags and left the building, the lease does not expire until 25 December 2019, paying £57,000 per annum. Next door is 105 Linthorpe Road, a single retail unit extending to 67.8 sq m (730 sq ft) on the ground floor, again with two floors of space above. It has a guide price of £137,000+. Another investment opportunity is a former community centre in Stoke on Trent, which has the potential for residential conversion or development, subject to planning permission. The semi-detached freehold property, 13 Priory Road, sits on a corner plot in a convenient residential location with shops, schools and leisure facilities nearby and has a guide price of £68,000+. With double glazing and gas central heating throughout, the property comprises, on the ground floor, an entrance hall, open plan office/kitchen area, a bathroom with disabled access and a storage cupboard. Upstairs there are three office rooms while, outside, there are front and rear gardens plus off-road parking. These three properties are among a variety of commercial lots which can be found in the two-auction catalogue, which covers the SDL Auctions North West auction at the AJ Bell Stadium and the SDL Auctions Cheshire and North Wales auction at Chester Racecourse, as well as 69 lots which are being sold online. Also going under the hammer at the AJ Bell Stadium are a small commercial unit in Huddersfield with a guide price of £28,000+, a warehouse with land in St Helens with a guide price of £65,000+ and a Grade II listed former bank in Bacup with a guide price of £185,000+.